July pill hits market to cause waistline inch loss — only one inch in six months???? Interesting article on DuPont’s pill, Howaru Shape. The weight-loss product is mainly a probiotic, but DuPont also provides a combo of probiotic and fiber. Apparently the probiotic along caused one inch waistline loss in six? months in the research group. I don’t want to mislead anyone and have not read other than a brief summary of the research; there are obviously other details in the study. Note that one research group taking the dual-time pill lost over 4% in body fat and one waistline inch loss plus added muscle, so there are beneficial results to be sure. Here’s our lovely Kiska pictured. She completed our formal corset waist training (three months of coaching) in early May. These show before and after pictures not altered in any way, one set corseted and one set natural. You can note that by the end of the three months Kiska could rather easily close the training corset and wear it up to 10 hrs a day. 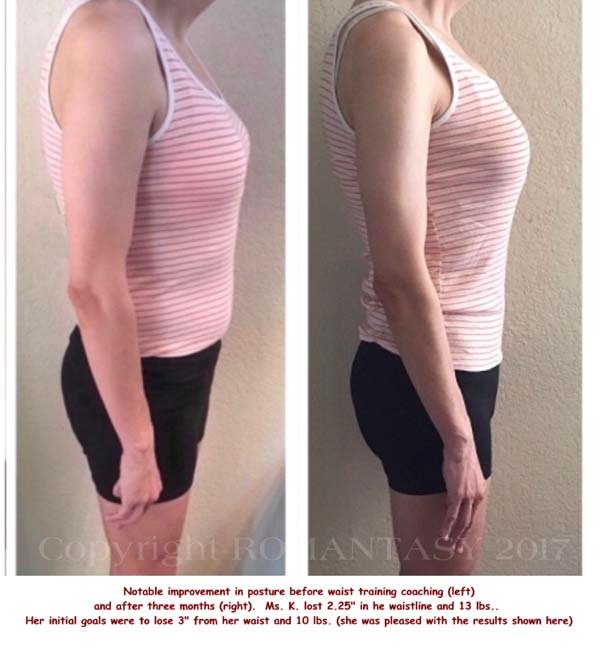 Here’s another picture of her before and after posture without the corset. Amazing, no? Can’t DuPont’s pills do any better than one waistline inch loss in six months? Hmmmmm……I’m wondering what six months of DuPont’s pills cost? Our coaching program is $400 (plus another $100 is taken on deposit but returned to you if you successfully complete the full coaching program. If you do not for any reason, then we donate $100 to our battered women’s shelter, La Casa de las Madres. How the coaching program works is accurately described on our website. 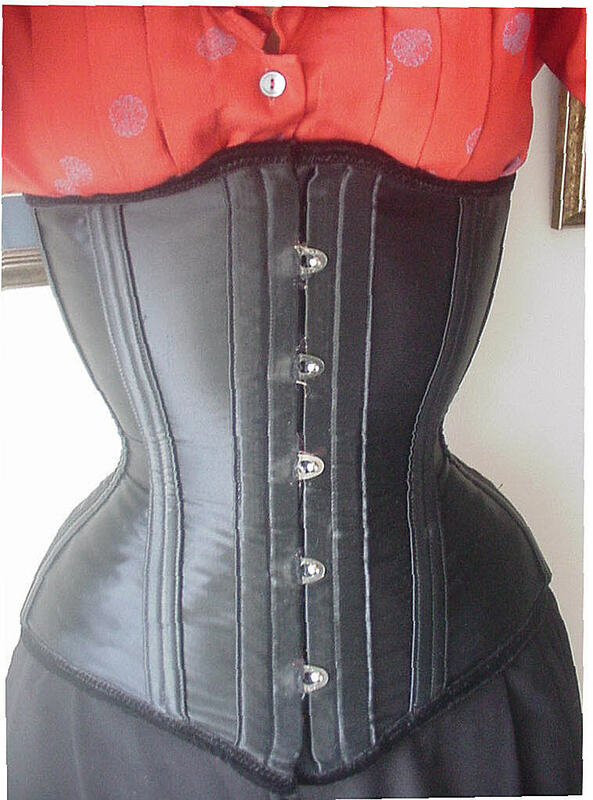 I’ve occasionally read questions online as to why anyone would “need” a coach for waist training? Some do not and some do. In addition, there is a lot of sharing of information by those with little experience, and experience counts for a lot to help the newbie not waste time by re-inventing the training wheels, or panicking at any little twinge or tweak while corseting. 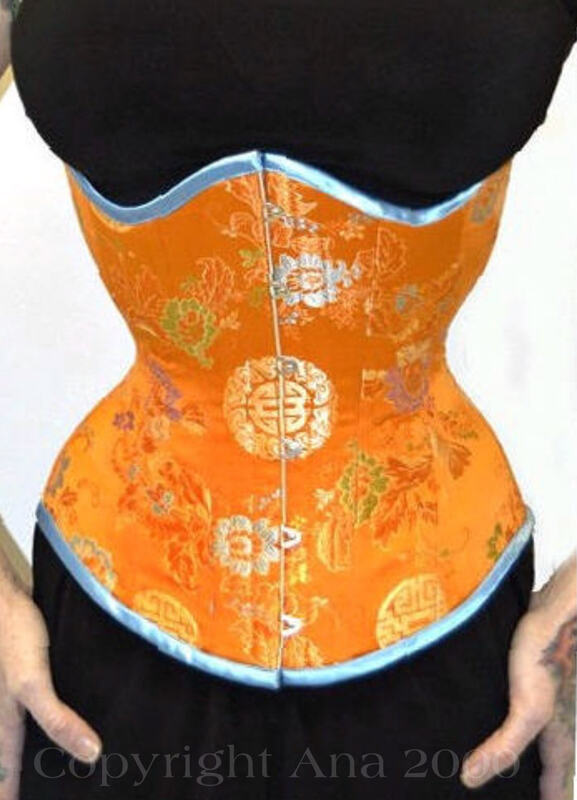 The more you know — the easier the go in corset waist training! LONDON – Getting one extra hour of sleep each night might shave a third of an inch off your waist and a couple of pounds off the number on the bathroom scale, a recent study suggests. The longest sleepers also had waist circumferences averaging 1.6 inches smaller than the shortest sleepers. Each extra hour of sleep was tied to a third of an inch difference in waist size and 0.46 of a BMI point, the study team reports. That’s why I have a section in my “how to” waist train book, that recommends 8 hrs or sleep! Yes, corset wear, nutrition changes (a few) and specific exercises are also highly recommended, but so is sleep. 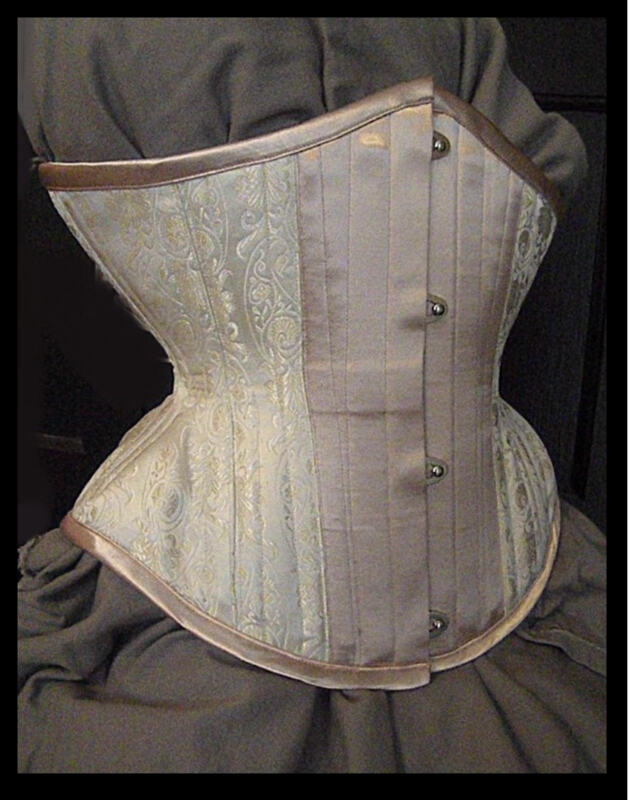 Please consider this information and new study carefully if you are set on a disciplined corset waist-training program! One of my mentors in helping me clean up my eating act (and pretty much get rid of added white sugar) is Barry Friedman. Occasionally I get an email from him, and the one received today, is worth repeating verbatim in major part (see below). Barry’s book on sugar addiction is highly recommended: I Love Me More Than Sugar. The title caught my attention two or so years ago, so I bought it and read it avidly. That book alone was motivation for me to cut out sugar for the 30 day experiment he recommends—and then I never looked back. Do I eat added sugar today, as did the lady below who “slipped up” after enjoying her initial successful no-sugar program? Yes, I do. I’m not a martinet when it comes to any “diet”, nutrition program, or exercise regime, even tho for my 30-day challenge I pretty much toed Barry’s strict line. If I say “none of this” to myself, my inner adolescent gets out of hand and starts acting up and that’s not a good thing! What I can do today after successfully de-sugarfying myself, is limit myself one any given occasion once or twice a week, to 1/3 of a cookie, two or three candy corns (not packages mind you, individual corns), 1/4 a slice of homemade tiramisou, and the like. I slipped up once after coming off the program and ate half a piece of iced carrot cake and boy! did I suffer pangs of nausea and headache commencing about 1/4 hr after. It was amazing, and a very good lesson. We have to give ourselves time to get sugar out of our system, just like we need to detoxify ourselves of most anything such as alcohol or coffee/tea and caffeine, if we want to omit those substances. Barry’s 30 day challenge is nothing to accomplish, really. Nor is our three-month waist-training coaching program, but as Barry says, one must be very clear about why you are wanting to waist train. Use his technique of drilling down on “so what?” or “why?” questions to get to the bottom of why you want to figure shape now, and did not do so a year ago and don’t plan to do so a year from now.Why now? Once you are clear, be sure you know safe and sane steps of “how to” do waist train (and consider my primer book telling you exactly that; order online). This morning I spoke with a woman who did 30 Days Sugar Free in December. She told me about the weight loss, new relationship to sleep, focus, and calm. She said it was the best she had felt in decades. Right after the new year she then jumped ship and went right back into the sweets. She’ll be doing the program again starting Tuesday, August 1st. She posted in our group last week and I read the sadness in the post. She had tasted victory and let it slip away. I called her this morning and coached her through a simple exercise – and I’ll do it with you right now, too. Grab a pen and paper… I’ll wait. I asked Amy WHY she wanted to be sugar free. “Healthier so that…?”, I probed. “So that I can feel better”, she said after a pause. “Feel better so that…?”, I pushed. “So that I can walk with my friends and niece!”, her voice lit up. “So that…?”, yep, she wasn’t done. “So that I can be laugh and move and have fun!”, she was really excited now. “So that I can BE ALIVE again, Barry”, and then she started to cry a bit. In a world filled with distractions there is, deep inside of you, a longing that is hidden away and maybe forgotten. It’s your WHY, and it holds the key to you achieving anything meaningful. Any change, addition, subtraction, or transformation you wish to make in your life MUST have a WHY that is so powerful it brings you to your knees. Without it, you haven’t got a chance. So How Do You Touch the Why? You do the exercise that I walked Amy through. With that one out in the light you will find it difficult to ‘go back to sleep’. Instead, I suggest you grab the momentum, circle that last one, and go deep into the feelings of having that in your life. Visual that BIG WHY as your reality. Take a few deep breaths into that. Tuesday, August 1st another group of people from around the world will begin the 30 Days Sugar Free Coaching Program. This program has supported thousands of people to evaluate and redefine their relationship with sugar. Here’s the link to join us. I will do everything in my power to get you through this month (including calling you on a Sunday morning) – and refund your tuition at any point in your life if you decide that I let you down. So I ask you this… why do you want a new relationship with sugar?